94 n Performance & Hotrod Business n April 2015 14 n PRECISION ENGINE n April 2015 PRECISION ENGINE They are about as inexpensive as you will find. If you are in a pinch or low on funds, a worm-gear clamp is likely to sup- port your system just fine. These clamps would be considered a "good enough" solution. The inner portion of a worm-gear clamp has slots for a gear to pull the clamp tight. These slots are notorious for digging into rubber and silicone, causing damage. Another important thing to consider is clamping area. Worm-gear clamps are gen- erally thinner than other clamp options, meaning the force exerted on the pipe is spread over a smaller area, which is less effective. Another downside is the potential for loosening. Because of the design, clamps can loosen after repetitive pressure oscilla- tions, which can result in separation of a boot from the pipe. For constant clamp- ing pressure, the options below are much more effective. 2. T-Bolt Clamp The T-bolt clamp is primarily what you see on modern CAC systems. This clamp provides a cleaner appearance and is more effective at holding greater pres- sures because of its band width. A wider band creates a larger clamp- ing area for a better seal and grab. Additionally, the T-bolt clamp utilizes a bolt and nylon lock nut to ensure that the clamp pressure does not loosen over time. This is a key benefit for pressurized intercooler systems. Clamp size is important. With a worm- gear clamp, you can use a larger clamp and tighten it enough to fit a smaller-size tube. T-bolt clamps, however, are designed to fit only a small variance in tube diameter. Pay close attention to the specs of the clamp you are using to ensure that it will fit prop- erly with your setup. 3. Constant-Tension T-Bolt Clamp The constant-tension clamp, a modifi- cation of the standard T-bolt clamp, uses a spring to provide a constant pressure on the surface. This allows the clamp to com- pensate for any expansion of the hose from temperature or pressure variations. These clamps require a specific installa- tion process to ensure appropriate torque is placed on the nut, allowing for ideal operation of the tensioning portion of the clamp. 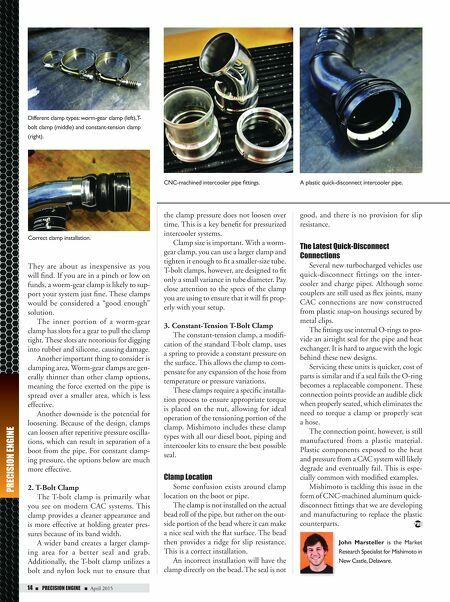 Mishimoto includes these clamp types with all our diesel boot, piping and intercooler kits to ensure the best possible seal. Clamp Location Some confusion exists around clamp location on the boot or pipe. The clamp is not installed on the actual bead roll of the pipe, but rather on the out- side portion of the bead where it can make a nice seal with the flat surface. The bead then provides a ridge for slip resistance. This is a correct installation. An incorrect installation will have the clamp directly on the bead. The seal is not good, and there is no provision for slip resistance. The Latest Quick-Disconnect Connections Several new turbocharged vehicles use quick-disconnect fittings on the inter- cooler and charge pipes. Although some couplers are still used as flex joints, many CAC connections are now constructed from plastic snap-on housings secured by metal clips. The fittings use internal O-rings to pro- vide an airtight seal for the pipe and heat exchanger. It is hard to argue with the logic behind these new designs. Servicing these units is quicker, cost of parts is similar and if a seal fails the O-ring becomes a replaceable component. These connection points provide an audible click when properly seated, which eliminates the need to torque a clamp or properly seat a hose. The connection point, however, is still manufactured from a plastic material. Plastic components exposed to the heat and pressure from a CAC system will likely degrade and eventually fail. This is espe- cially common with modified examples. Mishimoto is tackling this issue in the form of CNC-machined aluminum quick- disconnect fittings that we are developing and manufacturing to replace the plastic counterparts. John Marsteller is the Market Research Specialist for Mishimoto in New Castle, Delaware. Different clamp types: worm-gear clamp (left), T- bolt clamp (middle) and constant-tension clamp (right). Correct clamp installation. A plastic quick-disconnect intercooler pipe. CNC-machined intercooler pipe fittings.